This follows up my previous post: new Taipei MRT stations and wordy names. Although the MRT system resists fixing the mistakes in its station names — such as in wordy, unnatural English names or misuse of Hanyu Pinyin — that doesn’t mean it never changes a name. It does — and here I’m referring to things beyond the usual matter of romanization systems. In recent weeks a long-established MRT station name has been undergoing a quiet change. As this case reveals, however, it appears that the authorities have a rule that opposes change unless they want to take a perfectly good name and make it worse. I recently complained about the needless and indeed counterproductive insertion of Taipei and Nangang into station names, such as in the case of adding “Taipei” to the English name of what in Mandarin is only “Nángǎng Zhǎnlǎnguǎn” (南港展覽館). But that’s not the only case of “Taipei” given in an English name that doesn’t have the city name included in Mandarin. Two more instances of this are “Taipei Zoo,” which in Mandarin is simply Dòngwùyuán (動物園), and “Taipei City Hall,” which in Mandarin is Shìzhèngfǔ (市政府). There’s no clear answer. Although Hanziphiles love to proclaim “Just one Chinese character is enough,” the Mandarin language is most definitely not a monosyllabic one, especially when it comes to place names. (See, for example, Taipei street names and the monosyllabic myth.) So it’s possible that what’s happening here is the habits of Mandarin are being overwritten upon English. Interestingly, in metropolitan Taipei most native Mandarin speakers, if they had to add a geographical distinction, would probably call this the Mùzhà Dòngwùyuán (木柵動物園) rather than the Táiběi Dòngwùyuán (台北動物園). I’m more interested, however, in the case of “Taipei City Hall,” which in which in Mandarin is Shìzhèngfǔ (市政府) — again, no Táiběi. In this case adding “Taipei” makes sense because there really is another city hall stop on the MRT system: Xindian City Hall, which in Mandarin is Xīndiàn Shìgōngsuǒ (新店市公所). 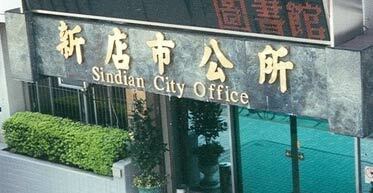 Translated literally, shìzhèngfǔ is city government and shìgōngsuǒ is city administrative office. They have different names in Mandarin because of Taiwan’s somewhat convoluted governmental structure, a shìzhèngfǔ having somewhat greater autonomy than a shìgōngsuǒ. Nevertheless, in English both would usually be called simply city hall. Although New York City has hundreds of times more people than, say, Hays, Kansas (population 20,000), both places have a city hall … because usually that’s what cities have, regardless of their size or importance. And for years the Taipei MRT has had a station named “Taipei City Hall” and another named “Xindian City Hall,” which is of course as it should be. Basically, if there’s a discrepancy between how something is usually said in English and how some government official in Taiwan thinks it’s supposed to be said in English, real English loses. The same applies to Pinyin, whose clear and simple rules continue to be ignored here. Both names — Xindian City Hall and Xindian City Office — can currently be seen on signage in the MRT system. The system maps next to MRT car doors have Xindian City Hall (see image at the left below). But the new long strips above the MRT doors (right) have Xindian City Office. I expect Xindian City Hall to disappear soon. Can anyone tell me what’s currently on that station itself? This entry was posted in Chinese, English, languages, Mandarin, pinyin, signage, Taipei, Taiwan and tagged mrt by Pinyin Info. Bookmark the permalink. I’ll stop by the Xindian City Hall station in the next few days with my camera and let you know the current status. Somebody, quick! Get a Sharpie, and fix (yes, fix!) these so-called “corrections” at the stations. Earlier this evening I looked at the area maps and signs inside the Fuzhong MRT station, which is the one closest to Banqiao City Hall. The map and directional signs all give Banqiao City Hall, not Banqiao City Office. The city hall building itself has no identifying signage in English or romanization that I could find.